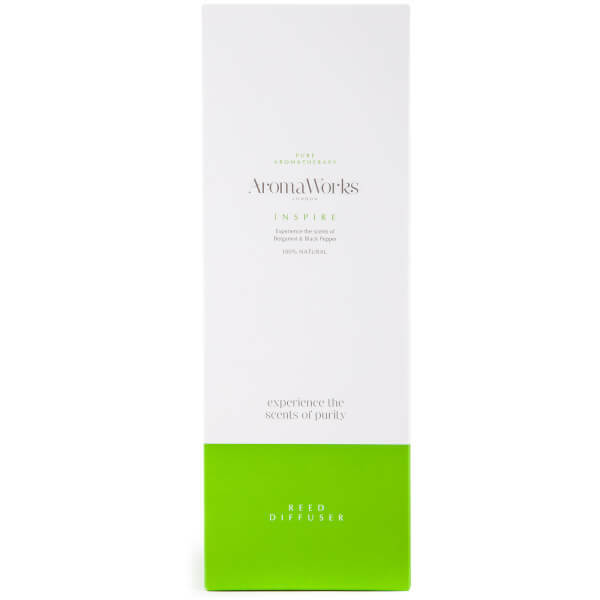 Infuse your abode with the uplifting scent of AromaWorks' Inspire Reed Diffuser; the perfect home fragrance to help energise your mind whilst dwindling feelings of anxiety. Utilising only nature's finest ingredients and an aromatic blend of 7 pure essential oils, the spicy fragrance opens with fresh notes of Black Pepper and Lime, before melting into a heart of calming Geranium. The oriental scent settles on a base of cocooning Caramel. Top Notes: Black Pepper, Juniper Berry and Lime. Essential Oils: Bay (Pimenta Racemosa), Benzoin, Bergamot FCF (Citrus Bergamia), Frankincense (Boswellia Carteri), Galbanum, Juniper Berry (Juniperus Communis), Patchouli (Pogostemon Cablin).